You can edit model metadata from Properties in the Manage This Model section of the model page. For best practices, see Discoverability and Category Guidelines. If you want to allow others to download your model, you can enable it from the Manage This Model section of the model page. See Downloading Models for more info. @che2016ac - When you get your model in the position you want, click Take Screenshot. Hi James! Why categories in my models dissapear at next day after downloading my model? There may be a limit on the number of categories? 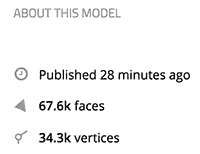 For many months now, categories and tags disapears each time I enter the 3D settings of a model. I'm I the only one having this issue or it is a 'normal' behaviour. If so, I don't understand why entering the 3D settings will affect the model properties !?! @fredlucazeau - We're aware of a problem with tags and categories being lost between Draft Mode and Published Mode - this will be fixed as soon as possible. However, I cannot reproduce your issue from entering 3D Settings of an already published model. Can you please give me more details and/or send me an email with a screen capture showing it? @James - Sent more detailed description and screenshots to the support email. Is there anyway of displaying poly counts, triangle counts and Texture resolutions per model? This would really help. I recently showed my folio, in an interview, to a potential employer using my artstation site. They asked what the poly, tricount and Texture resolutions were for my models.... I had no answer, as I thought the viewer would have told us. As for texture information, we're thinking about ways to implement this and other model inspector tools. Until then, you can just add texture information to the model description. I'm a bit confused that you "had no answer" if you created and uploaded the textures? Taking a quick look at your models, it seems you're using mostly 2k textures. 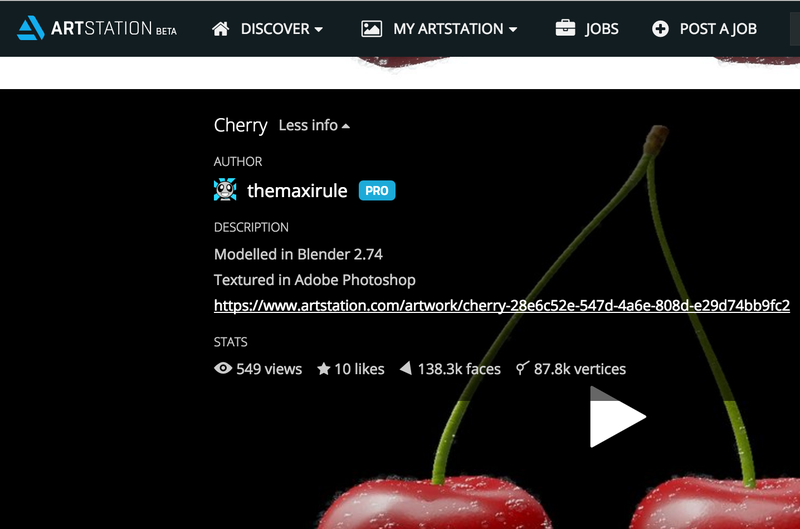 On artstation, the "about model" info is not displayed though right? This comment is a little off, I am trying to help your product out by giving feedback. "I'm a bit confused that you "had no answer" if you created and uploaded the textures?" So thanks for that, I hope this helps improve your product. Really appreciate the feedback, I've added your +1 to the texture inspector feature request. Once the model Upload,Properties can be edited. The save buttons do not respond. @antique Can you please go to the Network tab, click one of the failed requests, and go to the Response tab? That's perfect, thanks. What file format did you upload? Can you turn off the Printable/3D Hubs category or make sure you're using OBJ/STL (in a ZIP if you want)? i'm upload FBX (Included Maps). Yes that's correct. Did you get it working now? It's weird that you had to re-upload. I'll test and look into that. Hello, I`ve noticed in the past days that if I edit a models properties - all the tags disappear :( categories also, but that's not a big issue like writing 30 tags again. Some advice ? Thanks for the report! We'll get that fixed asap! Hi! Missing the opportunity to set prices for the last few models. Sorry I'm not sure what you mean. Is the option missing or is there an error message? Hi! I'm trying to edit the information on the model (removing the url for example in the description), but after saving it continues the same. Thank you form your comments.